Your cholesterol levels will go up when you opt for food rich in saturated fat. 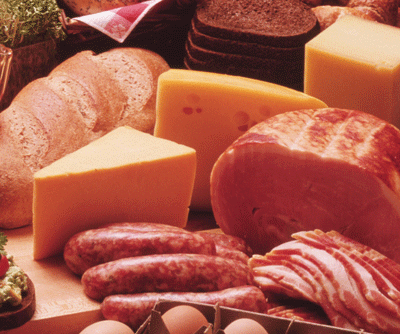 Learn how much saturated fat per day is safe to use and what alternatives are available. Everyone knows high Cholesterol can cause several health issues, but it is important to understand that cholesterol can be good or bad. LDL is bad cholesterol, and you will be experiencing several issues if LDL level rises in the blood. It stores itself in the walls of your blood vessels, leading to a blockage of atherosclerosis. It is important to understand that your body produces LDL cholesterol naturally, and you will be raising its levels by eating saturated fats. How Much Saturated Fat a Day? Saturated fats are actually fat molecules with no double bonds between carbon molecules because they contain hydrogen molecules. These fats are usually solid at room temperature. The American Heart Association recommends that an adult who would benefit from lowering LDL cholesterol should try to reduce saturated fat to 5-6% of total calories, which means that if you're eating 2,000 calories a day, it's okay to have about 11-13 grams of saturated fat. The American Heart Association's Nutrition Committee has suggested that anyone over age 2 (that has a healthy body) should aim to keep the amount of saturated fat less than 7% of calories they're consuming in a day. For anyone consuming 2,000 calories a day, less than 16 grams or 140 calories should come from food containing saturated fat. You should receive 25% to 35% of your daily calories from fatty food such as nuts, fish, and vegetable oils. What it means is that if you're taking 2,000 calories a day, you should be eating between 44-78 grams of fat. To maintain good health, you should ensure that your fat intake includes polyunsaturated or monounsaturated fat. These are unsaturated fats mainly found in fish, such as trout, salmon, and herring. You can also add walnuts, olives, avocados, and liquid vegetable oils such as corn, soybean, safflower, olive, canola, and sunflower to provide your body with enough good fat. Replacing saturated fat with these two types of fat will help keep your cholesterol level in control. You should include omega-3 fatty acids in your diet. It is a good idea to eat foods rich in this fat because it offers several health related benefit. Your aim should be to limit the total amount of trans fats to less than 1% of your daily calorie intake. It means that if you require 2,000 calories a day, you should ensure that only 20 calories (2g) come from Trans fats. Click here to learn more about trans fat foods. Saturated fats are available in many foods. You will find most of it in animal sources, including dairy products and meat. Examples include lamb, fatty beef, pork, butter, lard and cream, beef fat, poultry with skin, cheese, and other dairy products made from reduced-fat milk. Some fried food and baked goods have high levels of saturated fats. You will also find saturated fats in plant-based oils, such as palm kernel oil, palm oil, and coconut oil. The good thing is that these oils don't usually contain cholesterol. You should consider using oils instead of solid fats to make it more manageable for your body. You should consider adding vegetables, fruits, whole grains, fish, nuts, and low-fat dairy products while limited sugary foods and red meat. You should ensure that you're opting for poultry without skin and lean meat alternatives to keep your cholesterol levels low. Prepare your food without added saturated fats. You should add olive oil in marinades and salad dressing. You should buy low-fat variations of milk and other dairy products. Above all, you should develop a habit of checking the nutritional facts label whenever you go for grocery shopping. Reading food labels is a great way to discover how much saturated fats are there in it. You should also pay attention to the ingredients and know if the food you're buying is"partially hydrogenated". Avoid it because it contains trans-fat. Learn more tips to reduce saturated fat intake from NHS. First, you need to understand that cholesterol is not a fat, but it's more like a waxy substance. Your body produces some of it, and absorbs dietary cholesterol found in foods of animal origins, including eggs and meat. It is important to understand that cholesterol is important for your body to produce new cells and hormones. Interestingly, you don't need additional cholesterol in your food because your body produces enough of it. It is therefore important to identify how much cholesterol a day is safe in your case. If you eat food rich in cholesterol, this may push your unhealthy LDL cholesterol level up a bit. This increase in LDL levels isn't as quick and serious as in case of saturated fat, but it can still cause problems and lead to heart disease and stroke. It is important to know how much saturated fat a day is safe for you because most foods that contain saturated fats are rich in cholesterol as well. If you ask how cholesterol per day is enough for you, the answer is "anywhere less than 300mg". You may want to cut it further around 200mg a day if you're already at risk of heart disease.